If the 2011 holiday shopping season follows the trends of the 2010 season, consumers are likely to start searching online for holiday gifts early this year and Cyber Monday will edge out Black Friday as the most profitable day for online retailers, according to data from Marin Software's 2011 Online Marketer's Guide for the Holidays, a series of recommendations for online retailers based on 2010 holiday shopping data. During the 2010 holiday shopping season, four of the five top days for paid search conversions occurred in November. 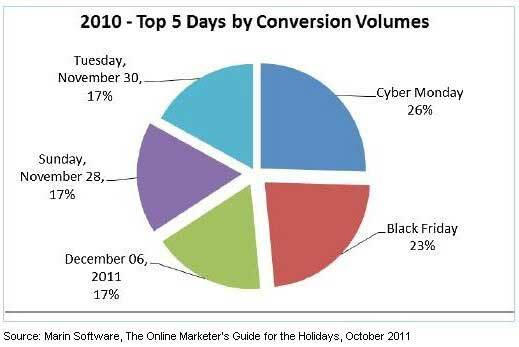 Cyber Monday (Nov 29, 2011) topped the list, accounting 26% of holiday conversion volume, followed by Black Friday (Nov 26) with 23%, and Nov 28, Nov 30, and Dec 6 each with 17% of conversion volume.